Closed in 2005 but now reopened and brewing again. This is a wonderfullly old pub that oozes authentic character and charm.The beer is exceptionally invigorating-- especially if you've cycled from Bamberg!! The brewer Georges is a great fellow and when I made my first visit to the brewery last November , he insisted that I must return the following evening for their bockbieranstich !! I duly did so and enjoyed a quite stupendous night of beer,food and dancing!! This was a 'beano' that I hope my CARA mentor ,Gordon 'biffo' Andrews will put top of the list for this coming November -- over to you 'biff^ !!! Wow, I can't believe there is a review for this place!! This is my family's brauerei outside of Bamberg Germany. My mother was born in the brauerei but I was born in the states. My cousin Georg still runs the place today. When I was a kid, I use to help on the bottling line on Saturdays in the summer! I also would do deliveries with my Uncle (Grandmother's brother) to the small villages in the area. Lots of memories! Herr Frank - I always admire your beer reviews.I would like to meet one day your great mentor 'Biffo', so that I too can learn how to make beer 'speak'. Keep up the good work. Hello to all friends of good brewing tradition. I am the younger brother of Georg Seelmann the former brewer and owner (died in march 2005). I am lookin forward to re-open up the place again in the old traditional way of good beer ,food and sevice. Right now it looks that i got a pretty good chance to get it done for the next summer season . Still a lot of work to do,but we will make it work. best wishes to all R Seelmann. Rudy, Good job!!! Please call Rick 231 250-8764 USA. Last week I was on a nice bicycle trip through the Steigerwald and visited - that's understood - also Zettmannsdorf. Unfortunately there were absolutely no signs of activity; so it looks, that the revival of this fine place will not take place in the next future.......! Rudy - It's Dianne from Dubuque. I will be in Bamberg in January with a group from Loras College. Is the brewery open now? Please send your contact information to me. Yes we have!!! 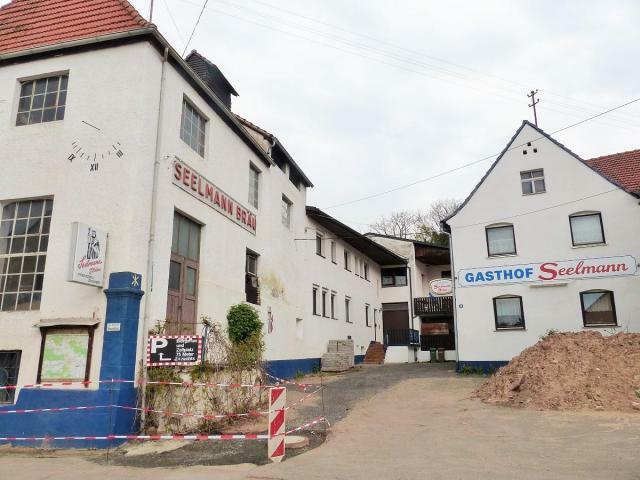 Brauerei Seelmann is brewing beer again in their own old brewery in Zettmannsdorf. Photos of 1st 2009 home production can be seen on our homepage. 21st of november Bockbieranstich. I've got lot's of ancestors in Zettmannsdorf, I would like to hear from others with ancestors in this tiny town. Please contact me Davenport (at) post.harvard.edu I can't put in the @ sign, because it rejects this post. Visted 07.05.15 on the way through to Bayer at Theinheim. Brewery looks very forlorn and decrepit, and I doubt if anything is happening at the site. A lady across the road said that the brewery was geschlossen. Whether that was all time, or just on the day we visited could not be established.